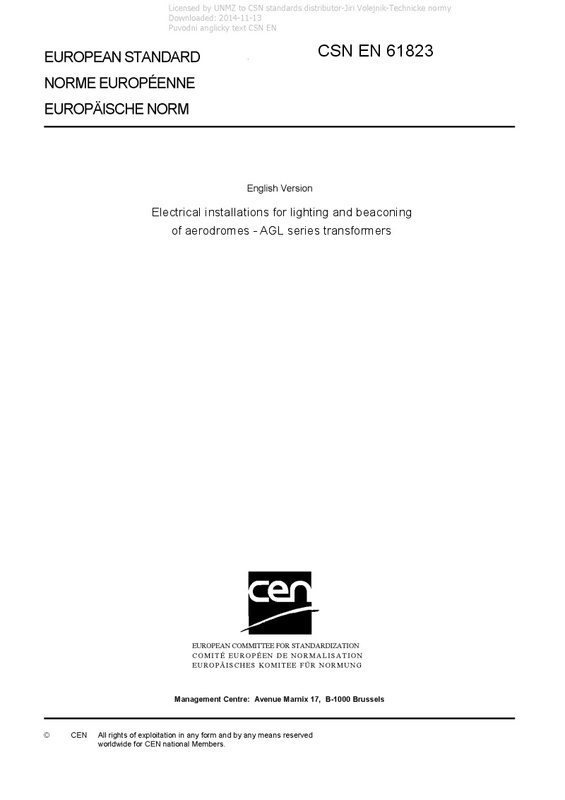 EN 61823 Electrical installations for lighting and beaconing of aerodromes - AGL series transformers - This standard specifies the characteristics of aeronautical ground lighting series trans-formers (AGLST) used in aeronautical ground lighting for 6,6 A series circuits, at a service voltage of up to 5 kV, supplied by constant current regulators up to 30 kVA in rating. AGL series transformers provide power to airport lighting luminaires or other loads (resistive) from their secondary circuits. The AGL series transformers provide continuity of the series circuit in the event of a loss of the load on the transformer, and electrical isolation between the primary circuit supplied by a constant current regulator, and the secondary circuit connected to the load under conditions defined in this standard.